After the sob fest that was yesterday's garden update, I feel like I should focus on the positive today. For reasons unbeknownst to us, our peppers did fairly well. While we gave up on our dream of making a batch of salsa using all/only homegrown ingredients (tomatoes, onions, green peppers, and jalapeño peppers), we were able to make whip up a batch using our fresh-from-the-garden peppers. 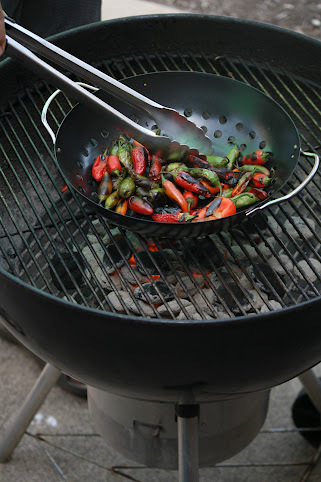 After picking and washing the peppers, Tom fire-roasted them on the grill. And then he tried to kill me by adding 17 times more jalapeño peppers than were needed to his tomato/onion/green pepper salsa blend.